Book Review: Yarn Over Murder by Maggie Sefton | Books, Movies, Reviews. Oh my! Twelfth in the Knitting Mysteries cozy amateur sleuth series and revolving around Kelly Flynn, her friends, and the yarn shop set in the fictional town of Fort Connor (standing in for Fort Collins) in Colorado. I do love a cozy! And Sefton’s cast of characters are warm, supportive, and so very caring. A close-knit group, they open up to those who need help while they feed my soul with their craft and creativity. It’s all about friendship and being there to help in negative times. While Yarn Over Murder uses third person point-of-view, it’s all from Kelly’s perspective as she helps her friends and networks for information, for Kelly has a nose for clues. I gotta say, it’s a real switch when the cops actually appreciate an amateur sleuth *grin*. It’s a wild race with friends jumping up to help save herds of alpacas from raging wildfires in the mountains of Colorado. Little do they know that they’re jumping from one actual fire into a metaphorical blaze. Kelly Flynn is an independent accountant who moved to Fort Connor when her aunt Helen died. Steve Townsend, a builder, is her boyfriend. Carl is her squirrel-crazy Rottweiler in a “battle” with Brazen Squirrel. Her close friends include Megan and Marty Harrington (he’s a lawyer); Lisa Gerrard (physical therapist) and Greg Carruthers (works at the university); Curt Stackhouse owns a big spread and is dating Jayleen Swinson whose ranch and her alpaca herd (that includes Shasta and Blondie) are in danger of the wildfire; Cindy (Curt’s daughter) is married to John, and Eric is their son, Curt’s grandson; Jennifer Stroud (a real estate agent) and Pete Wainwright (he owns Pete’s Porch Café where Eduardo is the cook with the great coffee and Sandy and Julie are waitresses); and, almost-twelve-year-old Cassie Wainwright, Pete’s niece who moved in with Pete and Jennifer when Grandpa Ben had a heart attack. Dennis Holt is a mountain man with a heart of gold, and Andrea Holt is the ex-wife he still loves. Jim Carson is Connie’s fed-up husband. Ellie is the donkey who led others to safety. …the yarn shop across the way from Kelly’s former house and current office. Mimi Shafer, a.k.a., Mother Mimi, owns it, and she’s married to Burt Parker, a retired police detective with his own ranch. Employees include the clueless Connie Carson who’s in major denial, Rosa, and Sophie. Hilda von Steuben and her sister, Lizzie, are patrons, knitters extraordinaire, and former schoolteachers — English literature and algebra, geometry, and calculus, respectively. Eustace is an historian in prison who has found a soulmate in Lizzie (Close Knit Killer, 11). Dan is Burt’s old partner. Officer Diane Warren is part-time these days and a barracuda in disguise. Lieutenant Morrison is their boss. Arthur Houseman, a real estate investor, is one of Kelly’s clients. with his new-built dreamhouse in Poudre Canyon. Don Warner has a development company. 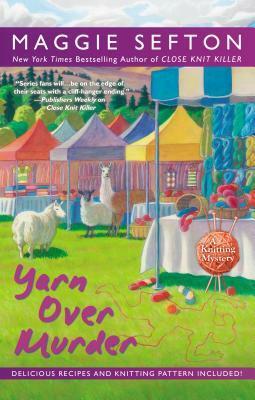 The cover is colorful as befits a festive Wool Market set up in the mountains in Estes Park. Surrounded by colorful tent canopies, sheep and an alpaca are staring at the table full of brightly colored yarns, specifically the overturned basket, skeins of yarn on the light green ground, one particular red yarn outlining a body’s silhouette. 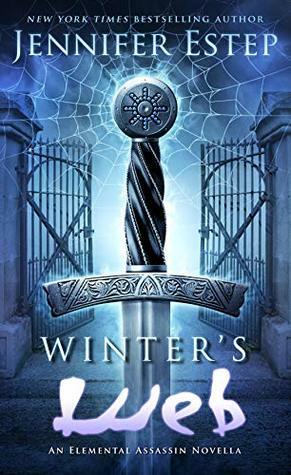 The author’s name is at the top in white against a red violet band while the title is in a lighter violet at the bottom left. The series information is in white inside a ball of orange yarn — four needles stuck through it. I have no clue as to the title, Yarn Over Murder. I love the sound of costs but so rarely read them. I think they sound fun but then something more gruesome always wins out!